Do you remember the ice cream drink called a Pink Squirrel? This adult ice cream drink is made with crème de cacao, crème de noyaux (almond liqueur) and vanilla ice cream. It’s a delicious after dinner drink similar to that other adult drink, the minty Grasshopper. The Pink Squirrel gets it’s “pink” color from the creme de noyaux. 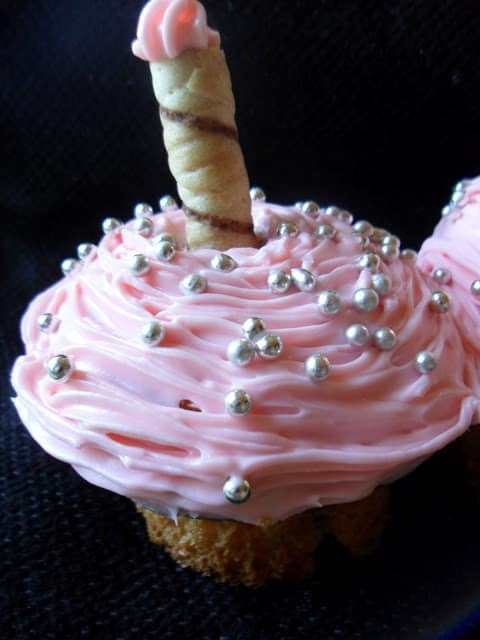 Enjoy the real thing or make these pink squirrel cupcakes. Cheers! The Pink Squirrel was invented in the 1950’s by Bryant Sharp at Bryant’s Cocktail Lounge in Milwaukee, Wisconsin. The Pink Squirrel is still enjoyed as an after dinner adult “shake” here in WI. You can stop at any Supper Club in the great state of Wisconsin and order one of these drinks. The almond flavored Pink Squirrel or minty green, crème de menthe Grasshopper or a Golden Cadillac, made with crème de cacao and Galliano. All ice cream drinks to have taken an illustrious ride in drink history. Starting as a glamorous cocktail, then becoming pop culture favorites but eventually fading into obscurity. The cocktails were traditionally made with heavy cream however over the years ice cream has replaced the cream. Pink Squirrel along with the Grasshopper and Golden Cadillac have become favorite ice cream cocktails. With so many different types of liqueurs available today, all three of these retro classics can be revamped into new, exciting and fun cocktails. With flavors like white chocolate, chocolate mint and any of the many flavors from Godiva Liqueurs, ice cream drinks are sure to make a sensational comeback. After all, blenders aren’t just for smoothies and margaritas! Ice cream drinks are only a shake away. Looking for more cupcake recipes? 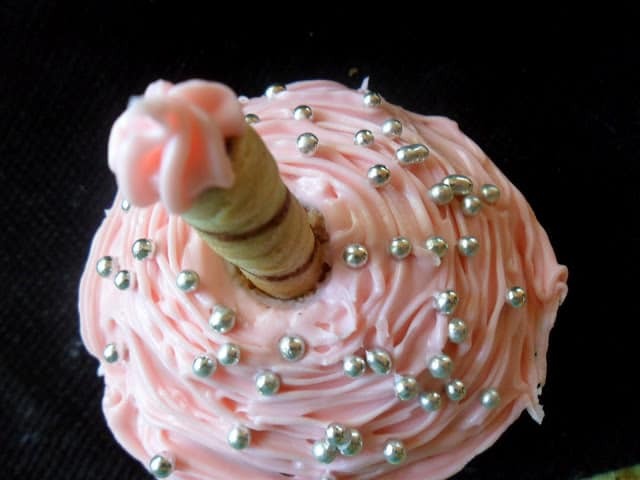 Try these fun cupcake recipes. Green Bay Packer Swirl Cupcakes, Tye Dye Cupcakes and Easy Apple Cupcakes. 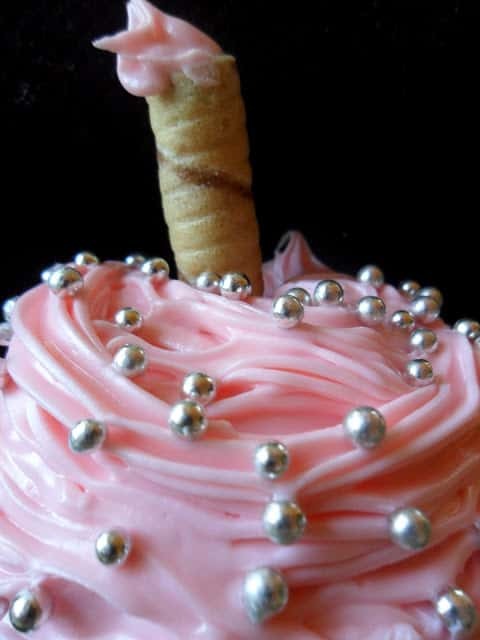 Pink Squirrel Cupcakes are reminiscent of the popular ice cream drink, the Pink Squirrel. Preheat oven to 350º Line muffin tin with paper liners, set aside. Blend cake mix, eggs, oil, water, creme de almond or almond extract, creme de cacao or chocolate flavoring in a large bowl until moistened. Beat with a mixer on medium speed for 2 minutes. Fill cupcake liners 2/3 full. Bake at 350º for 18 to 20 minutes or until toothpick inserted in center comes out clean. Remove cupcakes to wire rack, cool completely. Frost when cool. In medium bowl stir until combined, container of frosting, 1 teaspoon almond extract and 2 drops red food coloring. 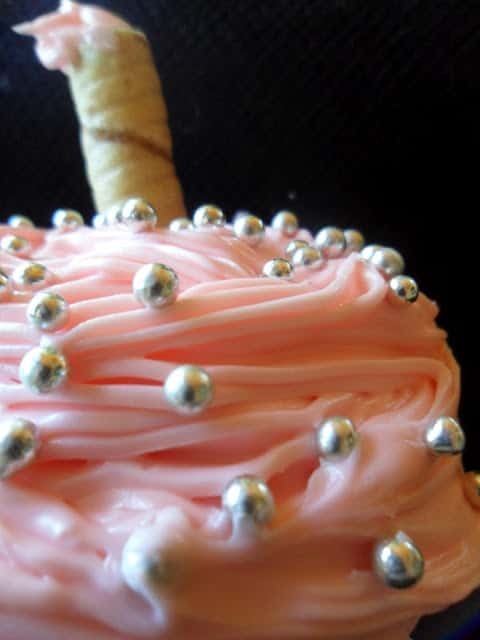 Frost cupcakes and decorate with dragees and de Pirouline rolled wafers. Banana Bundt Cake with Maple Rum Butter Frosting is another super delicious and classic recipe you are going to want to try asap. I love these:) Yes, I remember that Pink Squirrel, LOL. I am pinning these lovely cupcakes !